Vishal leads the group through the old city of Udaipur. 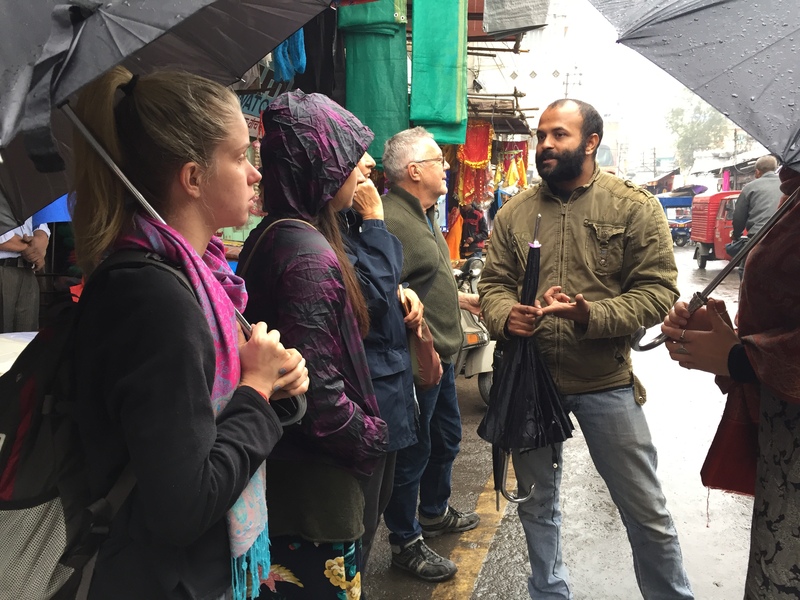 Our walk through the old city of Udaipur was framed by our hosts not just as a walking tour but as a “wisdom walk,” as a way of learning about and engaging with Udaipur as a living, dynamic entity. I have written previously about the treasure trove of information about the history, politics, economics, culture and ecology of place that can be obtained through reading landscapes. So it was with great excitement that I set off on foot with my CERES Global tour group friends for a stroll through the old city of Udaipur. There are a few conceptual influences on landscape reading that when practiced can turn a walk into a “wisdom walk.” The first conceptual influence is the discipline of political geography, which is concerned with the multiple intersections of geography, politics and government policy. Landscapes—urban built environments, rural agricultural settings and wilderness areas—can be a rich source of information about the political economy and culture of the country. Political ecology is the second key conceptual influence, examining the intersection between political economy and environmental issues, particularly in the developing world. It explores the influence of human economies and power structures over the ways in which different people interact with and are allowed access to resources from ecological systems. The observation of people and how they relate to their environments is the critical skill here. Our CERES Global tour party included people with an interest and expertise in permaculture. As a discipline, permaculture has a core of four structural elements: 3 permaculture ethics, 12 permaculture design principles, a collection of strategies and interventions that are deployed to actualise permaculture designs, many of which are not exclusive to permaculture, and a network of permaculture practitioners located around the world. The purpose of permaculture from a design standpoint is to re-create human agricultural, social and economic systems to mimic and harmonise more intimately with ecological systems, such that they become sustainable. The goals of permaculture practitioners depend on their unique needs and local ecological, social, economic and political conditions. Observing and interacting with the unique features of the location one is hoping to regenerate is the key initial step in the permaculture design process. Famous as India’s “city of lakes,” Udaipur was founded by Maharana Udai Singh of Mewar dynasty in 1553. The architecture and monarchic culture of the Mewars has given Udaipur a distinctive feel and it is this culture that is marketed to tourists of the city. More interesting to our group was the culture of the street. At a group of shops selling hand-made brooms and baskets, we discovered that craftspeople manufacture dozens of different kinds of brooms, made from different materials, for different cleaning and sanitation purposes. We met with the last remaining weavers of hand-made banana leaf bowls, who made the bowls for our lunchtime meal. We encountered a small cotton weaver’s shop, complete with early-2oth century mechanical cotton gin. We came across street spirituality in all manner of small and large temples, devoted to diverse gods from the Hindu pantheon. The old city is full of small shops and markets, selling everything from spices, pulses and fresh produce to clothes, domestic implements and mobile phones. It was explained to us that the market for consumable goods is large enough to provide all of the small traders with a living and through this system many people are able to earn a livelihood. Relationship-building is an important part of trade in this system, where sellers and buyers cultivate ongoing relationships for their mutual benefit. This is in contrast to the oligopoly of large supermarkets that have cornered the market in Australia, based on exploitative relationships with both their suppliers and their employees. The ecology of the old city was fascinating, with many different animals playing an active role in the streetscape. At the wet market, goats and sheep patrol the edges eating up scraps that would otherwise lay rotting on the ground. At night time, the animals move in and clean up the leftover food scraps left by the market sellers, keeping the precinct cleaner than it otherwise would be. We encountered many cows, sacred in Hindu culture, and saw how people would provide them with food scraps for them to eat. Of course the proliferation of animals is not without problems. While they clean up the waste of the human food trade, they also produce waste of their own that is a challenge to street sanitation. We experienced the chaotic interplay between pre-modern architecture and twenty-first century technology, with narrow alleyways that were designed three centuries ago to accommodate foot traffic now hosting cars, bikes, auto-rickshaws and lorries, in addition to pedestrians. It was not uncommon to see two vehicles idling in stalemate, unable to move past each other in the narrow streets with traffic back up behind them. It did strike me as ludicrous that anyone would bother driving a car through the old city, like trying to pilot the Millennium Falcon through the inner cavities of the Death Star (for my fellow Star Wars geeks out there). Harry Potter fans could easily visualise the old city as Diagon Alley. It’s easy to see how cities in Asia become exoticised for science fiction and fantasy stories for audiences in the West. We concluded our walk at the family home of our guide Vishal, whose family historically served in the Mewar court. We were shown a beautifully ornate room at the top of the building that has hosted Rajasthani and British royalty, among others, in its history as a meeting place for important officials of the Mewar dynasty. Different types of hand-made brooms. Fresh produce vendors. Notice the monkeys sitting atop the buildings behind. Fresh fruit and vegetables on sale. Logistics infrastructure for the fresh produce sellers. Part of the visual feast of architecture that fascinated the group. Beautiffuly coloured buildings, though not all the buildings in the old city are that old. Patricia negotiates to buy some spices. Grains and pulses on sale, the food staples. Vendors selling different types of cooking oils. A goat on the street. Goats are the ultimate omnivores. Fresh produce on sale at the wet market. Goats cleaning up scraps at the wet market. Making fried snacks from dal flour. Yes, they were tasty! Small temple to Lord Shiva on a street wall. CERES Global group navigating the old city’s alleyways. Ellie and Patricia help to weave banana leaf bowls. The separation between domestic life and the street is much finer than in suburban Australia. CERES Global team exploring another alleyway. Bovine friends enjoying our banana skin scraps. The old cotton weaver’s shop. Engrossed in the history of Vishal’s family home. Jones, M., R. Jones, M. Woods, M. Whitehead, D. Dixon and M. Hannah (2014). An Introduction to Political Geography: Space, Place and Politics. Florence, Taylor and Francis. Atkins, P. (1993). The Dialectics of Environment and Culture: Kimilsungism and the North Korean Landscape. Environment and Development: Views from the East and the West. A. Mukherjee and V. Agnihotri. New Delhi, Concept: 309-332, Atkins, P. (1996). A Séance With the Living: The Intelligibility of the North Korean Landscape. North Korea in the New World Order. H. Smith, C. Rhodes and D. Pritchard. New York, St. Martin’s Press: 196-211. Veteto, J. R. and J. Lockyer “Environmental Anthropology Engaging Permaculture: Moving Theory and Practice Toward Sustainability.” Culture & Agriculture 30(1&2): 47-58. Holmgren, D. (2002). Permaculture: Principles and Pathways Beyond Sustainability. Hepburn, Holmgren Design Services.